We are pleased to be in several magazines at the moment including a review on the Granite in Cycling Plus magazine and reviews of the Quartz and Micro in the Camping and Caravan Club magazine. One of our new retailers the Bike Shop, Newark was featured along with the Quartz in their local newspaper. Electric bike test riding again! The weather has been superb for the past week which has coincided nicely with some riding I needed to do. The first day (last Monday) was just a short recce, the weather has changed for the better and I was keen to get out on my favourite route. The sky was blue but the was still that edge in the air, with leaves starting to show slightly green and one marvellously pink tree it did seem that the season was turning. The next few days were slightly overcast and even a little misty, but the birds knew that spring was on the way. 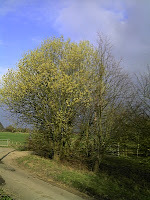 The bird song along the hedgerows has been fantastic, they have been swooping in and out of the hedges as I ride past. Even Friday when it lashed down with rain and really, I wasn't sure whether I wanted to be out there or not they were still singing their hearts out. After an hour in the rain, as my glasses dripped and my hands were cold, the weather started to improve slightly - it went from lashing to just drizzle! and I realised that actually it was great to be out there even on a day like that. 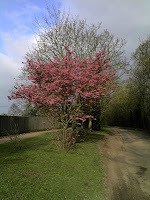 Yesterday was brilliantly sunny again and the breeze was warm too - a touch of early summer? Nature has moved on somewhat since last week, the pink tree is now over and looking rather drab, but the Hawthorn has sprung to life with a superb display and the fluffy brush catkins have almost a metallic gleam in the sunlight. The Celandines this year seem to be bigger than ever. When I passed the man made lake the first time there was an abundance of waterfowl and my plan was to take pictures on the way back, of course by then most of them were out sitting on the grass! There was a large flock of gulls on the water though, but as I approached something spooked them and they lifted in unison and wheeled above the water, in a panic I grabbed the camera, wobbled to a stop and took a few shots, and I'm actually quite pleased with the outcome. Over the past few days I have ridden over 220 miles in various weather conditions, but all of them have been enjoyable. I have used several different levels of electric assistance which I think will prove to be very popular and easy to use. Electric bike in the pits at Brands Hatch! Senior test rider Michael Neeves of MCN recently used a Batribike MIcro in the pits at Brands Hatch for the first round of the MRO Powerbike Championship. Using a lightweight folding electric bike to get around the pits is ideal. A report on how the championship round went together with a picture of Michael on the Batribike Micro is in todays MCN. You can now see how to fold our Quartz electric bike on YouTube. We took some video while we were at the recent Boat, Caravan and Motorhome Show at the NEC. Showing our Electric Bikes at different shows around the country means we get to do a lot of driving. We have just spent a whole week indoors at the NEC under artificial lighting and whilst it is a good show by the end of it you long to see proper daylight. So I really enjoyed the drive down to Chepstow from Lincoln, most of it is on the A46 that follows the old roman road, the Fosse Way that linked Exeter to Lincoln. Much of our travelling lately seems to have been during dull grey days but there seemed to be a lightness in the air on Thursday and a hint of spring in the verges and hedgerows. The Snowdrops have been out for some time but to me they are still a flower of the winter, now there is the odd spark of bright green in the hedges and the willows have that lovely lush aura that heralds the beginning of the new leaves. In the gardens the yellow flash of the forsythia flowers against their stark brown stalks seem to say that spring is in the air. Yesterday (Friday) was a glorious day the sun shone and the sky was a clear deep blue. There are tiny lambs in one of the fields the other side of the racecourse and they were jumping and running the way small lambs do, it seems incredible that they can spring into the air (much like a jump jet!) without so much as a run up, yet you never see sheep do the same thing. Today has been much colder, it started out sunny but soon the white cloud covered the sky as a chilling breeze started to blow, but the promise of spring is still here, we saw it in the sky yesterday, the clocks will be changing soon bringing lighter evenings. I am looking forward to cycling my local tracks and watching the season unfold.